Held at the Warner Town Hall…. 9AM. Landi Simone will be the Speaker. Her topics will include Reading Frames and Open Feeding. You can learn more about her at www.GooseRockFarm.com She also has several beekeeping videos on YouTube. Bee Cool and Be in Bee School! Complete the registration form and send your payment in early. We are looking forward to another great Bee School this year. Come and learn about this amazing hobby from some of our members. 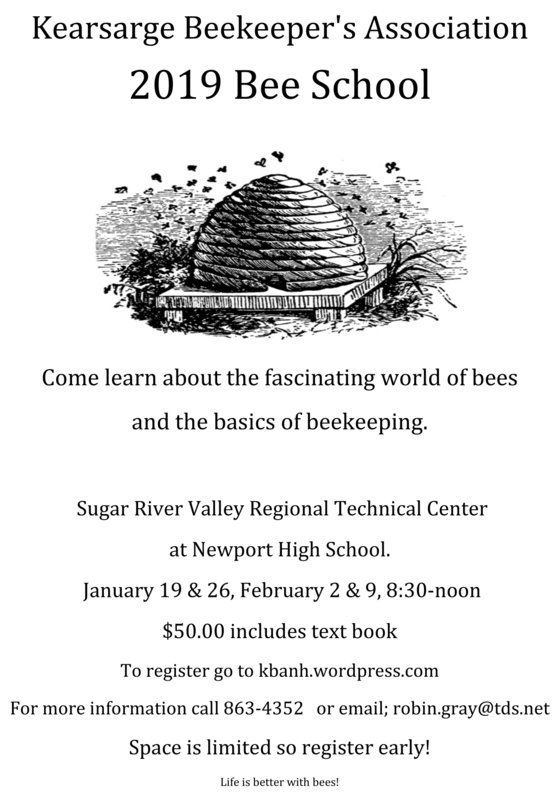 This year we are having the classes in Newport at the Sugar River Valley Technical Center. The classes are on four consecutive Saturdays starting on January 19th. October meeting is on October 13th, and will feature speaker Heather Achilles who will be reviewing the 2017 hive loss survey.